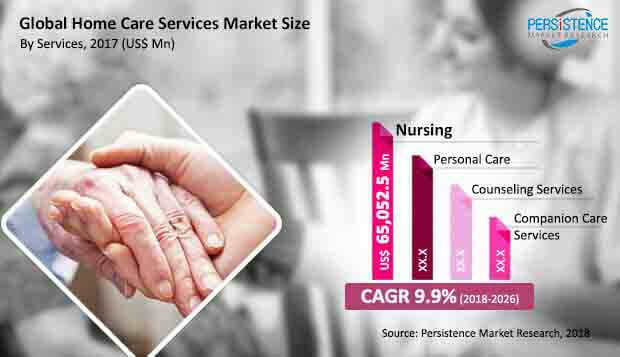 This report by Persistence Market Research (PMR) examines the global home care services market for the period 2018–2026. The primary objective of the report is to offer updates and information related to market opportunities in the global home care services market. Persistence Market Research offers an 8-year forecast on the global home care services market between 2018 and 2026. In terms of value, the global home care services market is expected to register a CAGR of 9.9% during the forecast period. This study demonstrates the market dynamics and trends in major countries that are expected to influence the current environment and future status of the global home care services market over the forecast period. The global home care services market report provides analysis and insights on personal care, nursing, counseling, and companion care services. These services provide medical care, encourage socialization among the homely, etc. To understand and assess various opportunities in this market, the report is categorically split into three sections, namely, market analysis by service type, financing source, and region. The report analyzes the global home care services market in terms of value (US$ Bn). To reach market size, the report considers market value of the global home care services across the above-mentioned regions. The market estimation presented in the report evaluates the total revenue generated in the global home care services market over the forecast period. When developing the market forecast, the starting point involves sizing up the current market, which forms the basis of the forecast on how the market is anticipated to take shape in the near future. For this, PMR conducted interviews with several subject matter experts in the home care services domain across the globe. Given the characteristics of the market, we triangulated the outcome based on different analysis based on the supply side, demand side, and dynamics of the market. In this report, quantification of data has been conducted along with provision of quality insights collected directly from the market through discussions with suppliers, distributors, and subject matter experts. We have also taken into consideration the year-on-year growth of the global home care services market, based on regional growth analysis, to understand the predictability of the market and to identify the right opportunities in it. Another key feature of this report is the analysis of the global home care services market by region, which is further segmented on the basis of countries and revenue forecast in terms of absolute dollar (US$) opportunity. Regional trends have been introspected, identified, and applied while forecasting the growth rates of the market. Additionally, the absolute dollar opportunity provided in the report is critical in assessing the level of opportunity that a provider can look to achieve from a sales perspective in the global home care services market. In this report, PMR has also developed a market attractiveness index for all segments, namely, services type, financing source, and its sub-segment. This index is intended to help in identifying real opportunities in the market. In the final section of the report, the global home care services market landscape is included to provide report audiences with a dashboard view, based on categories of providers in the global product portfolio; their key developments and strategies have also been included wherever possible. Home care service providers are continuously growing, owing to rising number of elderly patients suffering from disabilities and improving day care facilities. Hence, companies are more focused on wireless connectivity and advanced devices to deliver healthcare services. In order to meet customer needs, home care service providers are entering into various private care centers, because of the fact that, the elderly tend to choose residing in care facilities with specialized care services, which are provided in private care centres. Chronic conditions of the elderly and preventive care technology are opening up niche markets. Moreover, the driving factor of such day care facilities is the overall cost of the setup, which is comparatively less than hospitalization. Nursing care, companion care, and personal care are provided for 10-12 hours or 24/7, which is also expected to fuel market growth in terms of revenue over the forecast period. The demand for customized solutions via online applications is increasing in developed economies. The global home care services market is expected to record a year-over-year growth rate of 9.9%, and reach a market value of US$ 413,123.5 Mn in 2026. Few factors driving the growth of the global home care services market include increase in healthcare expenditure, increasing adoption of elder home care services, government/private/public funding for home care services, and well-developed infrastructure with wide-ranging services. Also, the rising number of elderly patients suffering from disabilities, and high the dependency ratio of elderly over the younger population is likely to fuel the home care services market over 2018–2026. By service type, PMR has segmented the home care services market into personal care, nursing care, companion care services, and counselling services. When compared to all the segments in the market, the nursing care segment had the largest market share in 2017, and is projected to grow over the forecast period with the highest CAGR of around 10.4%. Home-based care and community-based care segment revenue share is expected to be high due to the increasing adoption rate. European market revenue is likely to grow at the highest CAGR over the forecast period. The increase in the total number of home care services providers along with the increase in privately run institutions are factors likely to propel the growth in the revenue of the home care services market in the region. As per PMR market analysis, the U.S. market is likely to register a CAGR of 9.2% in the global home care services market during the forecast period, owing to the increase in government investments, increasing demand for personal care living and nursing care, and the high cost of the hospital-centric system in the country. The total number of home care companies in Europe is higher as compared to other regions. However, several companies are strategically entering into the developing economies in order to increase the number of home care facilities, which is likely to drive revenues of the overall home care services market in the region. The Asia Pacific Home Care services market is projected to expand at a high growth rate in terms of Y-o-Y over the forecast period.